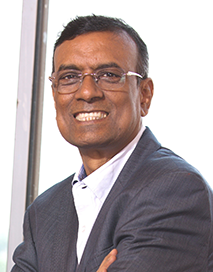 Mr. Chandra Shekhar Ghosh is the founder, Managing Director and CEO of Bandhan Bank. After completing his master’s in statistics, he joined a development organization, working at the grass root level. Seeing poverty at close quarters, he quit his stable job to set out on a mission to help the poor. Mr. Ghosh conceptualized Bandhan in 2001 to meet the twin objectives of women empowerment and poverty alleviation. Bandhan started lending to disadvantaged women who made productive use of the loans by investing in various income generating activities and building sustainable livelihoods for themselves, with many going on to become successful entrepreneurs. Mr. Ghosh led Bandhan to become India’s largest microfinance institution, serving 6.7 million underprivileged women. Realizing that microfinance alone could not address poverty alleviation, since a large segment of the population still remained unbanked, Bandhan applied for a universal banking license in 2013. Bandhan received its universal banking license from the Reserve Bank of India in June 2015, making it India’s first microfinance institution to become a full-fledged bank. Bandhan Bank was inaugurated on August 23, 2015 in Kolkata, and started off with 501 branches and 50 ATMs. Over the past 18 months, Bandhan Bank has spread its wings across 33 states and UTs with 3,565 touch points pan India consisting of 840 branches, 2,443 Doorstep Service Centres (DSCs) and 282 ATMs. The Bank has brought 10 million valued customers under the ambit of its operations. These are being served by a dedicated workforce of 24,600 employees. The bank has mobilized deposits over Rs. 22,200 crore and its loan book stands at about Rs. 23,000 crore. Mr. Ghosh’s exemplary work and dedication towards poverty eradication, women empowerment and now, bringing banking to every doorstep in India has honored him with several accolades and prestigious awards, such as the ‘Senior Ashoka Fellow’ (2007), ‘Entrepreneur with Social Impact’ (Forbes India Leadership Awards 2014), ‘Entrepreneur of the Year’ (Economic Times, 2014), ‘Lifetime contribution to the sector by an individual’ (Microfinance India Awards 2015), “Indian of the Year” (Business category, CNN-News 18, 2015), and ‘Entrepreneur of the Year’ (Financial Services Category, Ernst & Young). He was also conferred the ‘Outstanding Leadership’ Award 2015 by his alma mater, Dhaka University Statistics Department Alumni Association (DUSDAA), Bangladesh and has been bestowed the honour “Swarna Samman” by Senco Gold & Diamonds. Mr. Ghosh also sits on many associations and committees including the Bengal Chamber of Commerce and Industry, Managing Committee of Indian Banks’ Association, the Government of West Bengal’s Micro, Small and Medium Enterprises (MSME) sector committee, CII Economic Affairs, Finance & Taxation Committee, Financial Inclusion Committee, and Federation of Indian Chambers of Commerce and Industry.